Walliser German in comparison with Swiss German and the internal characteristics. Even if the language you hear in the Oberwallis sounds like incomprehensible Flemish: It is German, an original, and for many, a very difficult form to understand – it is Walliser German or at least a part of it is. To try and explain this language in as few words as possible is nearly an impossible project. I am therefore limited to a brief summary and refer in the footnote to the resuming literature. Walliser German belongs to Swiss German, which in turn belongs to the high "Alemannischen" linguistic area and therefore to high German. Swiss German differs from high German through characteristics, which are based upon a different transition from middle to high German and on the other side from Walliser German, and a part of these characteristic sounds, but not all, have left their remains in old and medium\high German. The new High German Diphthongization (from the sound «a» becomes two «au») before consonant (with sound) is not found in Swiss German. E.g. : In High German Haus, Feuer, Reis, remains in Swiss German as Huus, Füür, and Riis. The new High German stretch of the syllables, which end on a vowel, does not occur in Swiss German: Nabel (Naabel), ohne (oone) remains as Nabel, oone. On the other hand, Swiss German in contrast to new High German, shifts the «k» in the «initial sound» and after «1» and «rk» to «ch» (this does not apply to Basel and Chur); from the new High German Kind, Kuchen, Volk, Küchenkasten we have in Swiss German Chind, Chueche, Volch and the well known Chuchichäschtli. On grammatical and phonetic peculiarities of Swiss German I won’t go into great detail here, however, I would like to stress that the characteristics in the area, specified above, where hochalemannisch is spoken (Swabia, Vorarlberg, Liechtenstein, Switzerland), are not uniform or indeed the characteristics cannot be seen as coming from only this form. This is typical of Swiss German: It is varied and has enormous differences. These concluding remarks with respect to Swiss German can be applied in exactly the same form for Walliser German. There are actually no characteristics, which occur only in Wallis. However it does have a few characteristics with which one can familiarize with Walliser German at least in general terms. 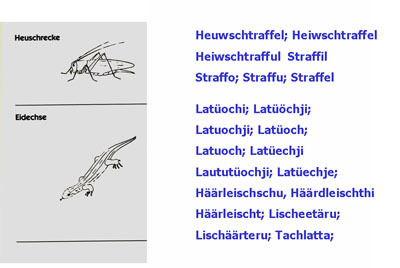 Apart from typical nouns such as Giretsch (Eberesche), Lattüechji or Häärleischu (Eidechse), Hopschol (Frosch), Heimina (Guter Heinrich) Straffil, Straffol, Hewwstraffil (Heuschrecke), Figfoltra, Pfiiffoltra (Schmetterling), Strälla (Striegel), Hienerleiber, Jüpini or Ruscheling(Alpenrose), etc. there are only a few pronounced characteristics. The broadest characteristic is the shift of «s» to «sch»; in new High German the old German «s» shifts in the initial sound to «sch», e.g. : medium\high German slafen becomes schlafen; Swiss German also shifts it before «t» and «p», e.g. : Geist to Geischt, Visp to Vischp. In Walliser German development still continues, here, every old German «s» becomes «sch», when in the preceding or following syllable an «i» occurs: sie (old High German siu) to schii, seines (middle\High German sin) to schiis, Haus (old High German husir) to Hiischer. Of particular note are the clarification and the rounding of vowels. The dark vowels «o» and «u» are lightened in Walliser German, i.e. They are not formed in the back of the throat as in the rest of Swiss German, rather further forward in the upper front of the mouth; because of this the over sounds become «ö» and «ü»: from Swiss German Huus, Boum, Muot, Uussicht, guet, Puur, (Haus, Baum, Mut, Aussicht, gut, Bauer) become Hüüs, Böüm, Müet, Üssicht, güet, Püür. The already lightened vowels «ü», «ö» and the Diphthong (double sounds) «öi», «öü», «üe» are rounded in Walliser German. i.e. They are no longer spoken in the round lip position, rather in a wide open mouth and therefore become «i», «e» and the Diphthongal «ei» und «ie» («ie» is always spoken in dialect posting as «i+e», it is not considered here as a stretch sound): From Swiss German Füür, Föön, müed, Fröit, Schüür, Dörfli, Füess (Plural), (Feuer, Föhn, müde, Freude, Scheune, Dorf, Füsse) become Für, Feenno, mied, Freit, Schür, Deerfji, Fiess. An interesting word within this range is Föhn/Fön: We are already aware from medieval times of the Föhn as a warm wind; therefore we have logically rounded the word too Feeno, however the hair dryer we have only recently become acquainted with; therefore we use the High German term as a dialect learnt word and say Föön. Further characteristic being replaced from new High German are «nk» with «ch»; the «n» before «k» disappears, thus the preceding vowel is stretched or diphthongised. From High German trinken, tränken, schenken, danken, Bank become in Walliser German triichu, treichu, scheichu, däichu, Bäich, [Baich, Böuch, Böüch etc.]. The often ancient character Walliser German is particularly produced due to the vowels being separated from the syllables. However, it is a phenomenon which decreases from the west to the east. In the lower part of the Oberwallis (Region Leuk, Turtmann, Raron) it is obvious to the listener that old High German is still used. The Phenomenon of «full separation of vowels from syllables» is gradually disappearing. Those who listen carefully to the older generation can still hear an example of this phenomenon. 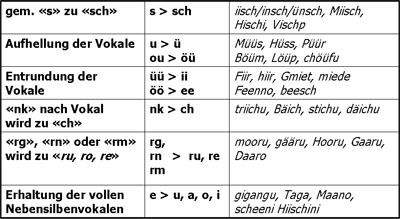 Similarly the pronunciation runs with the use of verbs; in the west one can find the full separation of vowels from syllables particularly within Partizip Il: gegangen, getragen, gegessen, wird zu gigangu, gitreit, ggässu. These characteristics are somewhat used roughly or even anciently; therefore a Walliser, who wants to adapt it within dialect, leaves the first full separation of vowels from syllables out; in principle Walliser German adapts itself through the influence of mobility and modern communication. Mannji (Mann) is used more frequently than the word Ma(n) and is by no means a reduction. (Naturally, when you look at its usage exactly, there is a difference: Mann is used in a personal, emotional context, one says miine Maa [mein Mann], äss ischt an groosse Maa gsii[er war ein grosser Mann], but da uber steit as Mannji [da drüben steht ein Mann], hiite hetiisch as Mannji psüecht [heute besuchte uns ein Mann]). Another difference to Swiss German is the plural endings (majority ending) to «-ini»: Männer becomes Mannjini, Häuser to Hiischini. Not very remarkable but nevertheless a characteristic common to this region is the grammatical makeup of sentences: The Zuricher says der Huet vom Vatter [der Hut des Vaters], whereas the Walliser way is almost poetic in its makeup: ds Vattersch Hüet [des Vaters Hut], ds Müetersch Schnützlumpo [Mutters Taschentuch]. Also considered little is the use of the established adjectives: aus er isch afen alt or ds Chind ischt ganz lieb gsii wird äär ischt afu aalte und ds Chind ischt ganz liebs gsii [er ist schon alt und das Kind war ganz lieb]. Another quite well known characteristic is the objectification (Neuter Noun). For persons or things with male or female articles the neutral form is used: e.g. : der Lötscher, ds Leetschi, (die) Anna, ds Anni. This characteristic is particularly common in family names: ds Tooni, ds Vreni [Anton, Verena] and job titles: ds Müüri, ds Metzgi [Maurer, Metzger].As the rule stands objectification does not mean a devaluation or a lack of respect - ich bin halt ds Schmidji und unser Schulvorsteher, der Rektor des Gymnasiums, ist ds Räkti – this is the usual way of speaking in present day Wallis. In the above, I have tried to characterize Walliser German. In the following I will roughly outline the dialectic differences and versatility of Walliser German. Important to note is: the above-mentioned characteristics rarely apply to the whole Oberwallis and some parts are not only applied in Oberwallis. The following map deals with the most important differences: The main differences specified here are easy for an untrained ear to hear and determine an approximate origin of the speaker; in addition they show how non-standardised Walliser German actually is. It is this point that is so often discussed, pronunciation, what is the right way or wrong way – but with dialect it is never what is right or wrong, instead the question should be: How do we say it here? All of these clear cut borders run from the north to the south and therefore, divide the Oberwallis into an eastern (Chääs) and a western (Chees) half. The clear cut long syllable borders between «ee» und «ää» run between Ausserberg and Eggerberg, western Blatschieder through Visp and east of the Saastales: schweer - schwäär (schwer). Of interest when discussing these borders is that up until a few years ago this was also the traditional border between Fleck – (Simmentaler) and Braunveih (Brown Cattle). From the milk of a flecked cow one made Chees, from the milk of a brown cow one made Chääs (Käse). Further examples are: Scheeri - Schääri (Schere) meeiju - määiju (mähen) dreeiju - drääiju (drehen). Wir Kinder (Ausserberg) neckten unsere Mutter (Baltschieder) immer mit dem Sprüchlein: ... mit der Schääri an de Zääwe der Chääs chratzu (Neckspruch zur unterschiedlichen Lautung: ... mit der Schere an den Zehen den Käse kratzen). Further east we experience the reverse phenomenon with «ä» und «e» in short syllables. The border runs to the east of Brig: pchännu - pchenne. Additionally, here we experience the weakening of the full separation of vowels from syllables on «e»; this weakening runs from the west to the east: if it means e.g. : in Turtmann gigangu, in Visp they say ggangu, in Brig ggangä and in Goms gange (gegangen). The so-called Gommer border (a part of which belongs to Eastern Rarons) is the border between iisch und insch; with this insch im Goms one immediately recognises the origin being east of Brig. 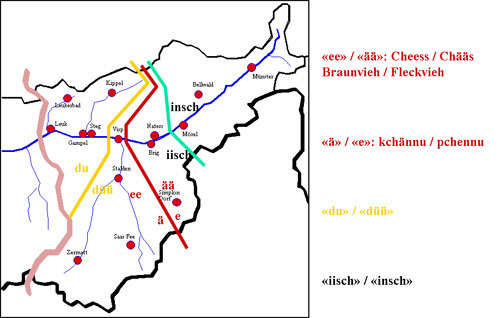 A further clear cut border forms the different pronunciation of the personal pronoun «du»; it is spoken west of the line Eggerberg – Baltschieder – Visp and the Vispertäler often with a short, nasal «u» du. In the east it sounds long and light «üü» düü. Besides these clear cut borders there are still many smaller nuances, which to the well informed ear are still possible to locate the speaker’s origin e.g. : Saaser, Grächner, Lötscher, Leuker, Rarner, and Grengjer or Münstiger. 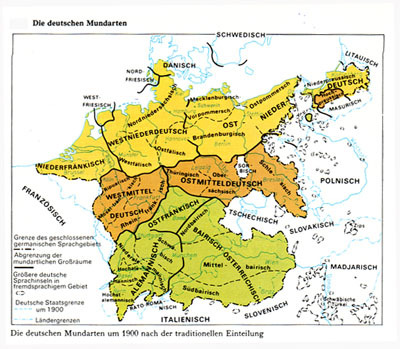 In the large valley Gemeinde, the dialect is so flattened though immigration from all sides and through the media that the differences are very difficult to determine, although it is still possible to recognise some local phenomena. 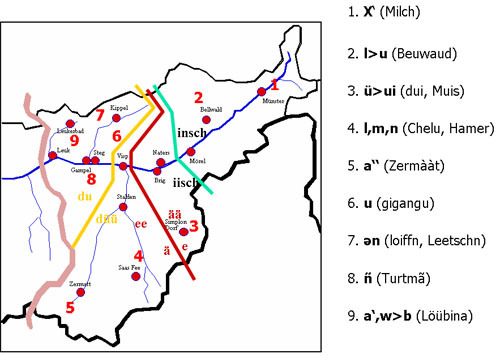 The ch-sound is spoken in the western Oberwallis very roughly – palatal to velar (for this reason we are often confused by the Germans with the Dutch – the Walliser pronounce or “crack” the «ch» in a similar way to the Dutch or the Flemish. ); to the east this sound becomes softer firstly in the initial sound and later also in the final position: Kchuchchi zu Chu[c]hi. In Bellwald the «l» is vocalised, as in Bern German, to «u»; the Bellwalder also say Beuwaud (Bellwald); die Simpeler (Simplon Dorf) through the diphthongization of «u/ü» say dui, Muis (du, Maus); die Saaser (Saastal with Saas Fee, Almagell, Grund, Balen) does not double the sounds «l, m, n» between vowels, apart from their original speech melody and in addition to their unorthodox word position: Wenntd Sunu nitschiint, triibi Hamer und Chelu wägg! (Wenn die Sonne nicht scheint, werfe ich Hammer und Kelle weg). With the Zermatten (and less obviously with the Leukerbadnern) the «a» sounds so bright and open, as one is used to from German stage language. In the rest of Oberwallis it is spoken very dull and dark (closed), so that it sounds very nearly like the high German «o». Clear cut peculiarities are also found in Lötschental. It defines itself linguistically within some ranges so strongly that one speaks mockingly of the Kantn Leetschn (Kanton Lötschen). On the one hand the endings are spoken on «u/e» (-en) as pronounced in high German with «n», but the «e» is so weakened that practically only the «n» (vocalised «n») remains, thus also Leetschn, bringn, loiffn (Lötschen, bringen, laufen). On the other hand the high German «nk», which is spoken «ch» in Walliser German, becomes «h», therefore triihn (trinken). In the area Raron Turtmann the full separation of vowels from syllables in the final position are strongly nasal: Turtman, bringun(Turtmann, bringen). A last phenomenon, which I would like to point out here, is the shift of «w» to «b» in the Leukerbergen (Erschmatt, Bratsch, Guttet, Feschel) and in Leukerbad: Löübinuverbüübige instead of Löwwinnuverbuwwige (Lawinenverbauungen).